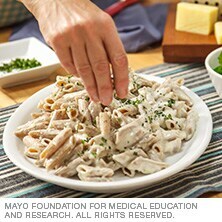 This creamy sauce is low in fat, thanks to skim milk and low-fat cream cheese. Heat a medium saute pan over medium-high heat. Add the olive oil and garlic to pan and saute for 1 minute. Stir in flour; lower heat to medium and continue to cook for 3 to 4 minutes. Gradually add the milk to the mixture, stirring often, until it is well-blended. Cook until the mixture is thickened. Stir in the cream cheese and continue to cook until it is completely melted in. Remove pan from heat; stir in the Parmesan cheese and pepper. Continue to stir until Parmesan cheese is melted in and the sauce is well-blended.